The Chimney Rock Estate truly is a gorgeous site – white and in the foreground of Napa’s incomparable rolling hills, surrounded by acres of vineyards Chimney Rock Winery really is an amazing estate to be seen and experienced. Since the 1980s this estate has been producing it’s signature Cabernet Sauvignon combined with smaller runs of other vintage, yet no less delicious wine varieties. Chimney Rock Winery wine tours bring you into the heart of a winery that combines the finesse of a Napa Valley winery estate with the look of unique South African/Dutch architecture. Located in Napa Valley’s Stags Leap District, it is no wonder how this winery is able to produce such fantastic Cabernet Sauvignon. The original owners Hack Wilson and Stella Wilson had a vision to produce incredible wines in the Napa Valley. The architecture through and through reflects their South African roots and boasts a Dutch-South African mystique. With expansion steadily increasing throughout the years the delicious wines prove the elegance and precision with which these wines are made – Cabernet Sauvignon, Tomahawk Vineyard Cabernet Sauvignon, Elevage, Elevage Blanc, and Sauvignon Blanc make up a roster of world class wines that make Chimney Rock what it is today. On your Chimney Rock Winery wine tasting tour you can pair these wines with delicious cuisine made on site and bask in the beautiful surroundings of the Chimney Rock estate. On your Chimney Rock Winery wine tour you will enjoy the wonderful world of Napa Valley wines in one of the regions finest estates. Give us a call and book your Chimney Rock Winery wine tour today. A winery tour to Chimney Rock is a special experience to say the least. It begins with a call to Apex limousines. One of our staff members will help plan and develop with you your winery tour to Chimney Rock. We can accommodate parties of nearly any size and are able to begin our journey throughout the Napa Valley, Sonoma Valley or the Bay Area. A winery tour is the perfect way to experience Chimney Rock because it brings you directly to the winery with the ease and relaxation of a comfortable new model limousine. Each wine tour to Chimney Rock Winery will be in the hands of a professional and experienced limousine driver who can pick you up and bring you to the winery without any problems. Our comfortable limousines and the professionalism of our drivers make a wine tour with Apex an unforgettable experience you will be asking for more of. With the beauty and elegance of the Chimney Rock Winery combined with the artisan taste of each and every wine they produce in the backdrop of the natural stunning elegance of the Napa Valley, we guarantee that your winery tour to Chimney Rock Winery will be the experience of a lifetime. Whether you are going to venture on your wine tour to Chimney Rock Winery for the first, second, or tenth time, we provide outstanding customer service from the first phone call until we drop you off at the end of our journey together. Let us know if you want to book your wine tour to Chimney Rock Winery today and together we can adventure to one of Napa Valley’s finest wineries together in comfort and luxury. Apex is a wine tour and transportation limo service provider. We are an experienced and well respected wine tour and transportation company in the region and we go to great lengths to ensure that every transportation service we provide to our clients is the best it can be. 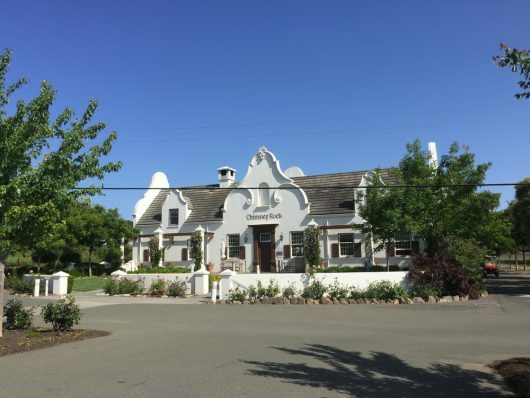 We offer full comprehensive wine tours and transportation services to Sonoma and the Napa Valley as well as Livermore for our east bay area locals – each a unique and wonderful wine country located right here in Northern California. We gladly customize itineraries for our clients for their wine country adventures – no matter what you want to see, do or experience our staff are ready and willing to help provide you with the wine tour and transportation that you and your party need. With years of experience we can provide restaurants and wineries and other destinations that will make your wine country journey unforgettable. Our customer service representatives are also available to help with the booking and reservation processes at restaurants and wineries to make the entire booking process as easy as can be. We believe that our clients are the best in the world and so we always treat you as such. Our team of professional drivers will ensure your safety every single step of the way from pick up to drop off. We only work directly with experienced and professional limousine drivers who both take care of you and create a professional but fun and comfortable environment. For your wine tours and transportation needs look no further than Apex – together we can make your wine country dreams come true one limousine charter at a time.